If you have been reading Betsy’s blog, you will notice that she enjoys cooking, a lot. Part of her joy in cooking is how she can relax while putting together an amazingly great meal in an hour or so and escape from her high tech software career with pots, pans and knifes. For me, the joy of cooking comes from the thrill of slow cooking food, such as the the slow BBQ of ribs or a brisket in a Texas smoker for 4 to 10 hours. But this is a warm weather activity, so during the colder seasons, I combine slow cooking with my many years of experience in the lab. (Ask Betsy how she enjoyed the trips to the lab to check on my experiments in the “warm room”). There is a cooking technique called Sous Vide, French for “under vacuum”. I will explain the reason for the name later. The goal of Sous Vide is to cook food to a thermodynamically stable state in contrast to a specific kinetic time point. I’ll bet you didn’t expect to run across these terms in Betsy’s cooking blog. So much for her inviting me to be a guest blogger. What does this all mean? Normally, food is cooked for a certain amount of time to reach a final desired temperature; say, for a rare steak, cooking it for 15 minutes over a 500F fire to reach an internal temperature of 125F , or, maybe, roasting a chicken for 1 hour in a 350F oven to reach an internal temperature of 180F. In these examples, cooking longer than the 15 minutes or 1 hour causes the food to overcook. This is what I mean by a specific kinetic time point. Get the time right, and the food is ready: too short of time and it’s undercooked; too long of time and it’s overcooked. However, even when done correctly, the food actually has a temperature gradient from the outside to the inside. The outside of the steak is at 500F while the center is 125F. Cook a thick enough steak, and it becomes very hard to get the steak right without under- or overcooking the steak. The same is true with poultry or any other food. It’s just very difficult to get all the food to a single uniform temperature. Instead, consider setting the heat source to 125F or 180F. Cook the food long enough, and it will reach exactly 125F or 180F. It might take a while to cook, but no matter how long it’s cooking, the food can’t overcook. This is the thermodynamically stable state. Putting food into a water bath of this sort would cause most of the flavor to be washed out, sort of a low-temperature New England boiled dinner. This is where a seal-a-meal bag comes to the rescue. 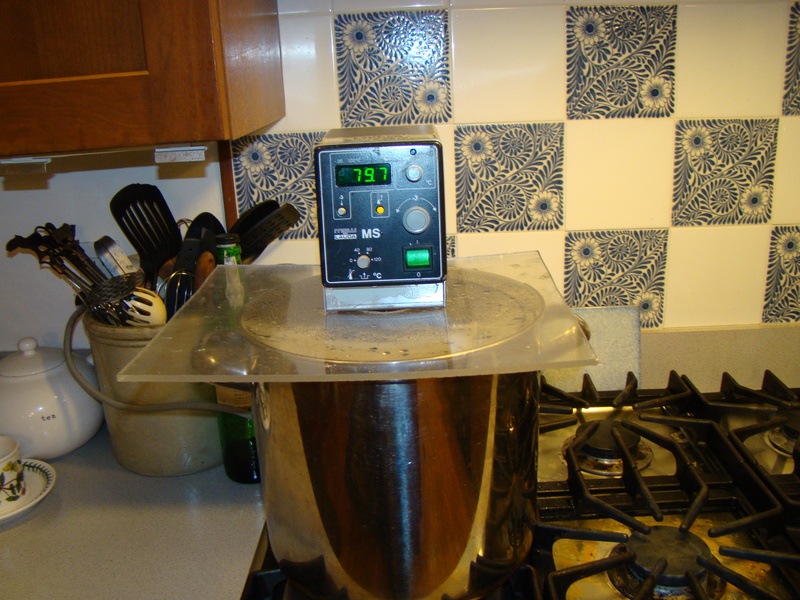 If the food is placed in a bag with spices and then sealed under vacuum (hence the origin of the cooking style “Sous Vide”) with the FoodSaver, the whole bag can then be placed into the pot, left until the food reaches steady state and then enjoyed at the finally desired temperature. Coat the bottom of a glass baking dish with half the salt. Layer the legs in a single layer in the baking dish. Cover the legs with the remaining salt. Distribute the peppercorns, cloves and garlic slices over the legs. Place 4 legs into a seal-a-meal bag. Add 1 Tbs duck fat, and seal the bag. Repeat with the other 4 legs. Place the bags into a 180F water bath. Cook for 12 hrs (yes, twelve hours). Remove the bags from the bath and chill. Leave in refrigerator for a month or more. You don’t want to eat them right away. 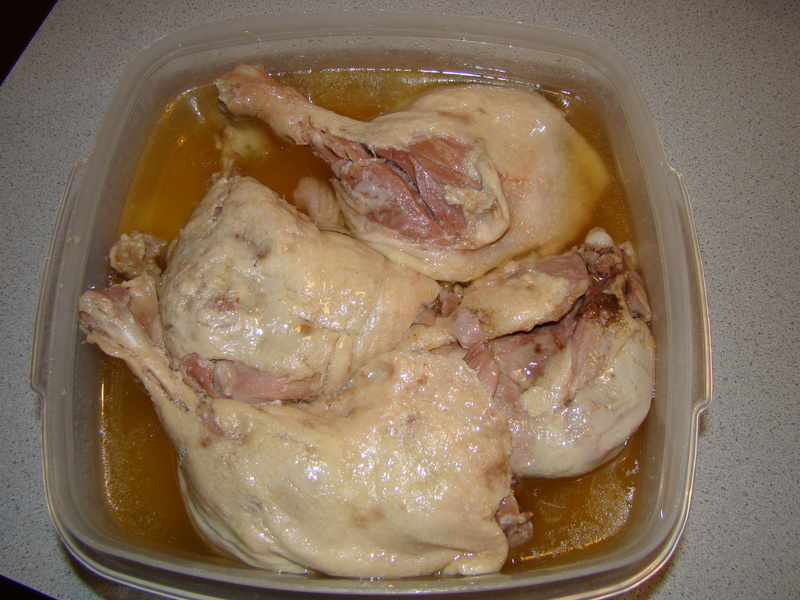 I will be back then to discuss preparing the duck legs confit in Part 2. 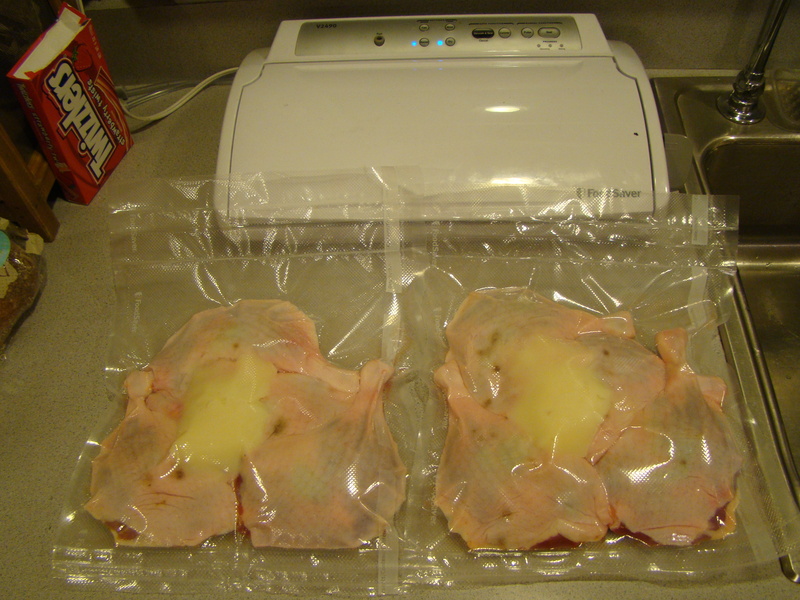 Posted on 8 March 2010, in General and tagged duck, Sous Vide Cooking. Bookmark the permalink. 5 Comments. leave it for a month? seriously? this sounds like a cooking technique that might actually work for me! Howard. Those legs do not look appetizing. I am afraid I will only be convinced by empirical evidence. Such as a taste. photos will NOT work for proof. nice try. ship me a crispy delicious leg! Somehow I don’t think the legs will travel well and stay crispy, but you can come over when it’s time for Part 2.